Barr, Nevada. (2012). The Rope. Minotaur Books; New York. I’ve always been a big fan of Nevada Barr’s mystery novels, for two reasons: 1) they take place in the serenity of nature (more specifically, in various U.S. national parks), and 2) her central protagonist is the gutsy and seemingly invincible park ranger, Anna Pigeon. I credit Anna with being one of my primary motivators for wanting to be a parks warden – along with the similarly-themed work of C.J. Box, who writes about fictional game warden Joe Pickett. All image rights to Minotaur Books 2012. 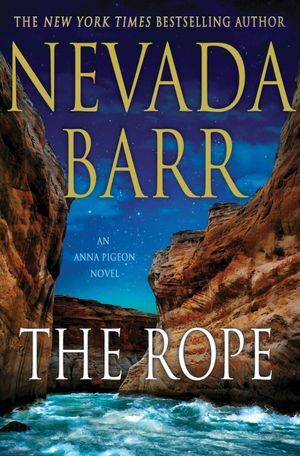 The Rope was published in 2012, much later than the initial Anna Pigeon mystery written in 1993 (called Track of the Cat) (Wikipedia Bibliography). The Rope is thus a prequel and describes the background story of Anna’s life – the trauma induced by the death of her beloved partner, the mental anxiety so integral to her character, and the beginnings of her physical toughness (Lytle, 2012). I found that the adventure and suspense remained high throughout my reading of The Rope, with a lovely little plot twist at the end. Having devotedly read through most of the Anna Pigeon novels in my early teens, I was surprised to return to Nevada Barr’s writing and find myself skimming through paragraphs describing Anna’s internal mental conflicts. I warmed to the baby skunk (“Buddy”) that she adopts and laughed over the tender and imagined love affair between Anna and Jenny Gorman. But Nevada’s writing is not terse or focused; instead, it tends to wander, alternately huddling low to the ground and soaring high over cliffs, constantly drowning in verbosity – and the reader can easily identify in these prose Nevada’s lengthy education in and association with drama and theater (Wikipedia Bibliography). Anna’s character is eminently admirable and ultimately lovable, however, and the central reason that I enjoyed this book. I put Anna’s strong female role model example in the same category as Sue Grafton’s star sleuth, Kinsey Millhone (though Sue’s writing is the epitome of pointed, stripped-to-the-bones fiction). I highly recommend picking up The Rope and transporting yourself into the beauty and mystery of the Glen Canyon National Recreational Area. For a second opinion, check out this review of The Rope by Mark Stevens.